Rabbi Daniel Moscowitz, regional director of Lubavitch Chabad of Illinois, leading a Havdalah ceremony. 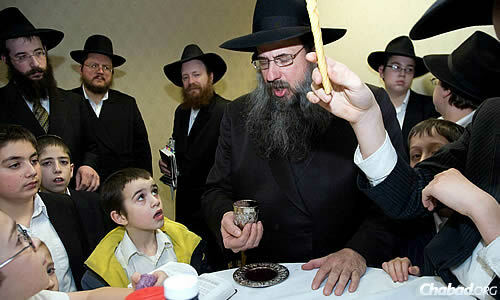 The rabbi passed away last year at the age of 59. 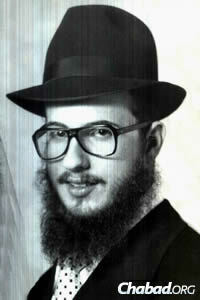 Beginning this week, events throughout Illinois will mark his first yahrtzeit. 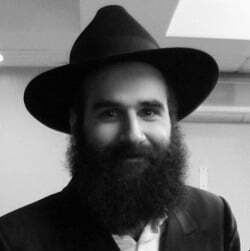 The Jewish community of Chicagoland is preparing to mark one year since the passing of Rabbi Daniel Moscowitz, director of Lubavitch Chabad of Illinois until his untimely passing at the age of 59, who has been credited with spearheading a Jewish renaissance across the Prairie State. Since returning to his home town of Chicago as a young rabbi in 1976, Chabad’s infrastructure has grown to include 64 emissary families, kindergarten through 12th-grade schooling for boys and girls, and Chabad Houses in 26 cities and towns across Illinois. 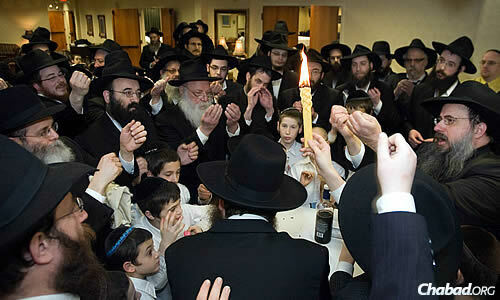 The gathering comes on the heels of simultaneous special Shabbat celebrations at Chabad synagogues across the state. Bais Menachem in West Rogers Park—which Moscowitz co-founded with Rabbi Baruch Epstein in 1995—will be joined by Rabbi Binyomin Scheiman of Des Plaines, Ill., who, together with his late wife Hinda, was the first emissary couple Rabbi Moscowitz brought to Illinois back in 1980. Concurrently, Lubavitch Chabad of Northbrook—which the rabbi founded with his children, Rabbi Meir S. and Miriam Moscowitz—will host a “Shabbat of Reflection and Inspiration” with a program that will start before morning services and last until mid-afternoon. Chicago Sun-Times columnist Neil Steinberg has been tapped to address the crowd, speaking about how Rabbi Moscowitz left a long-lasting effect on him and his family. The commemorations will begin even earlier in the week at two Chabad houses directed by the late rabbi’s children. In trendy Bucktown, where Rabbi Yosef and Sara Moscowitz founded their Chabad center in 2005, ground will be broken for a brand-new mikvah to be built in the rabbi’s honor. Even deeper in the city, in River North Gallery District, where Rabbi Avraham and Chava (Moscowitz) Kagan have been serving since 2013, women will gather to bake challah and perform the mitzvah of separating dough as per the biblical commandment that it be consecrated for the Aaronic priests. “Rabbi Moscowitz was like Aaron the High Priest,” explains Rabbi Yona Reiss, Av Beth Din of the Chicago Rabbinical Council (cRc) and a close associate of the late rabbi. “Aaron was known for loving every person and bringing them close to Torah. Likewise, Rabbi Moscowitz sought to draw everyone near through his warmth, friendship, love of every individual and the absolute delight that he took in their every accomplishment. At the same Havdalah, signifying the conclusion of Shabbat and the beginning of a new week. 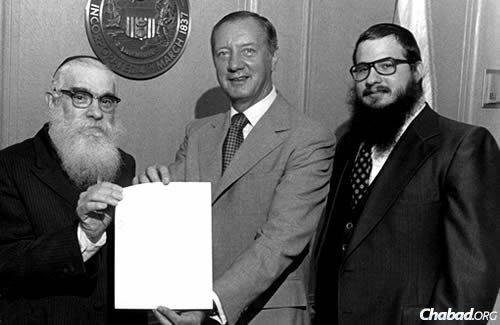 Rabbi Moscowitz, right, came to his hometown of Chicago in 1976 to assist Rabbi Solomon S. Hecht, left, head Chabad emissary of Illinois. Here, they are shown with Michael Anthony Bilandic, the 49th mayor of Chicago and former Chief Justice of the Illinois Supreme Court. Hundreds participated in the Siyum celebration of the daily study of the Rambam (Maimonides) two years ago at Congregation Bnei Ruven in Chicago. From left are Rabbi Baruch Hertz of Congregation Bnei Ruven and host of the evening; Sephardic Chief Rabbi of Jerusalem Rabbi Shlomo Amar, who addressed the participants; Rabbi Moscowitz; and Rabbi Yona Reiss, Av Bet Din of the Chicago Rabbinical Council.